CSA plays indoor soccer at Wide World of Indoor Sports in North Kingstown at 1610 Davisville Rd, North Kingstown, RI 02852. The Indoor Soccer Season is played in 2 sessions. The 1st session starts at the beginning of November and goes through til the beginning of January with additional tournaments played for ThanksGiving and Christmas/New Year. 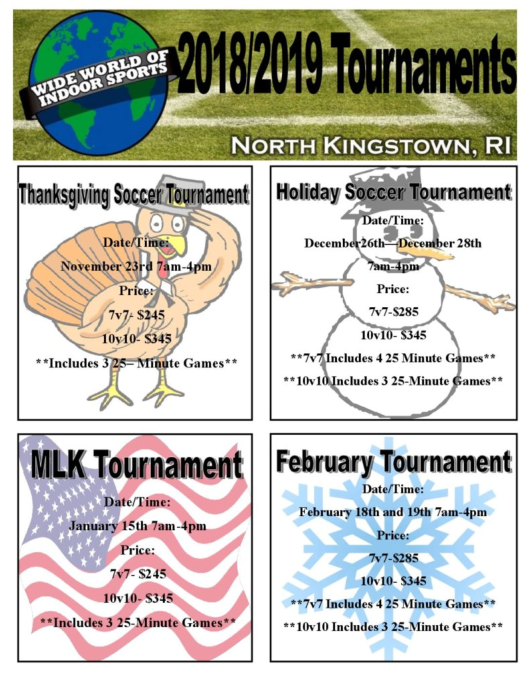 The 2nd session starts in January and goes through til the end of March with additional Tournaments for MLK in January and a Tournament in February.